The Government of Canada is investing $2 million to help women entrepreneurs, as well as small and medium-sized companies in Northern Ontario. The funding will allow them to get the skills training they need to raise the venture capital they need to expand their businesses. Organizations that will benefit from this announcement include the PARO Centre for Women's Enterprise and the Northwestern Ontario Innovation Centre. The Government of Ontario is also supporting PARO's Women's Enterprise Initiative with a $100,000 investment through the Northern Ontario Heritage Fund Corporation. Ontario Heritage Fund Corporation. The two projects receiving funding will focus on empowering women, strengthening the development of small businesses, enhancing innovation and increasing employment opportunities throughout the region. goals. These initiatives will strengthen the regional economy." "Our government is proud to support PARO's Women's Enterprise Initiative through the Northern Ontario Heritage Fund Corporation. This investment will help PARO prepare female entrepreneurs across Northwestern Ontario with the resources they need to successfully develop and grow their businesses." 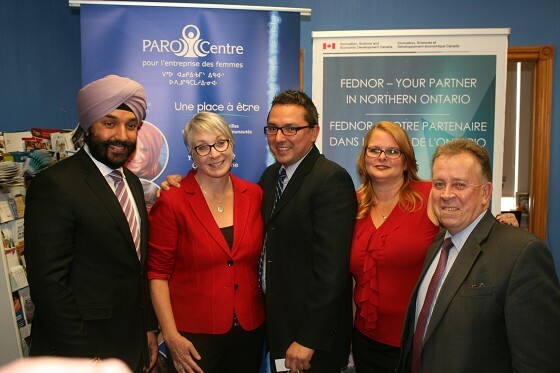 "I am proud of FedNor's longstanding partnership with the PARO Centre for Women's Enterprise, whose record of success in helping women entrepreneurs realize their business dreams is nothing short of impressive. Increasing the knowledge and skills of all women business owners, including those who are Indigenous, Francophone, new immigrants or young, will help them grow their companies and increase profitability." "The Next Level program offered through the Northwestern Ontario Innovation Centre will not only help new businesses secure market access for their innovative developments, but also assist existing businesses to undertake new marketing techniques to expand sales opportunities and grow their operations." succeed in today's global economy." visit: fednor.gc.ca and follow us on Twitter @FedNor.